Combating ‘neglected’ diseases using nature’s apothecary Crypto 2.0 and DAWCs: Dawn of Decentralized Autonomous Workers Councils. It’s not headline news that our brains are the seat of our thoughts and feelings. The brain is a body’s decision-maker, the pilot of its actions and the engineer that keeps all systems going. The brain suits the body’s actions to its surroundings, taking in sensory details and sending out appropriate and timely responses. We’ve long attributed the marvelous workings of the brain to the intricate structures formed by its highly specialized cells, neurons. These structures constitute the hardware of the brain. But new genomic research reveals that, at an even deeper level, emotions and behavior are also shaped by a second layer of organization in the brain, one that we only recently created the tools to see. This one relies on genes. We are beginning to appreciate how genes and neurons work together, like software and hardware, to make brain function possible. Learning to understand this two-layer system can help us understand how the environment affects behavior, and how to hack the system to improve mental health. It is time to fully recognize gene activity not as the background utility of the brain, but as an integral part of its operation. 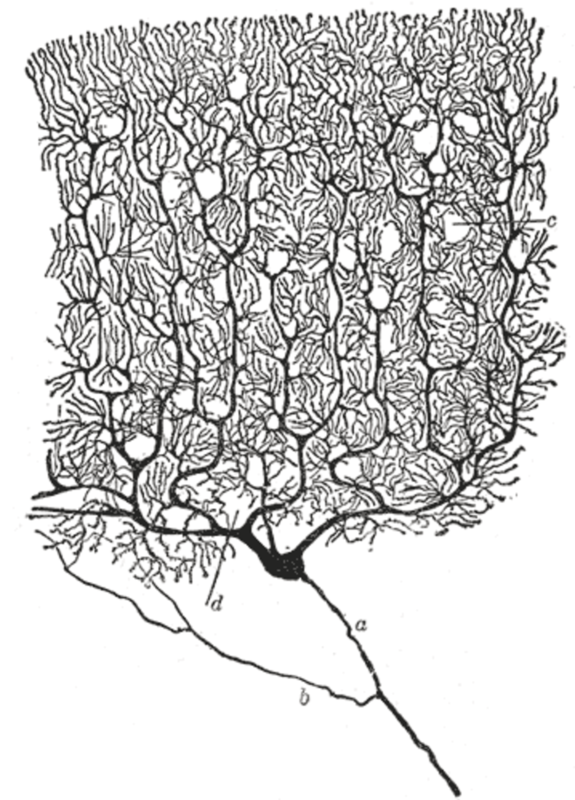 A cat’s neuron stained with Golgi’s technique as drawn by Santiago Ramón y Cajal. The sheer complexity of the human brain became apparent in the late 19th century, when two skilled anatomists, Camillo Golgi of Italy and Santiago Ramón y Cajal of Spain, invented tissue-staining techniques that revealed intricate microscopic networks of neural cells. We now know that about 100 billion neurons connect with each other in a human brain to form complex circuits that carry electrical and chemical messages to make memories and govern behavior. 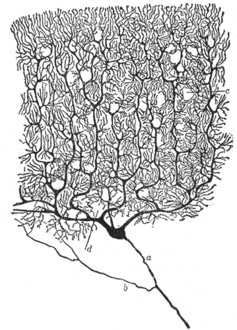 This physical structure, the one that yielded itself to the scientific tools of the time, constitutes the hardware of our neural control system, which is uniquely rewireable by experience. Throughout the 20th century, scores of scientists characterized the sugars, lipids, proteins and myriad other molecules that build, run and repair our brains. These molecules seemed to stay out of the limelight; they appeared to play a supporting role to the neurons that ostensibly controlled our behavior. Genes are translated to proteins that also play a major role in the brain. But the 21st-century science of genomics delivered a new surprise about the brain. Genomics examines the entire set of genetic information contained within cells, the activities of genes and the interactions between them. Genomics revealed that the brain’s genes are considerably more involved in regulating behavior than ever imagined. Genes direct the production of the above-mentioned brain molecules via intermediaries made of RNA. RNA molecules tell the machinery of the cell when and how to make the proteins it needs to grow and function. Technologies developed over the last 20 years have allowed researchers to monitor the ebbs and flows of RNA produced by every gene in the brain with increasing precision. These studies have unveiled a surprisingly close relationship between behavior and gene activity in the brain. Some of the earliest insights into the close relationship between behavior and brain gene activity came from an unlikely source: the brain of the honeybee. Honeybees, like humans, live in a complex society, and they too are strongly influenced by what others around them are doing. My laboratory discovered that changes in behavior are orchestrated by altered activity of thousands of genes in the bee brain. In some cases, the relationship between behavior and brain gene activity is so close that a computer program can accurately predict, from patterns of brain gene activity alone, the bee’s behavior. It turns out that similar genomic responses are found in many other species, including human beings, a finding that reinforces the idea of genes within neurons as a driving force underlying behavior. This discovery was surprising because neurons are known to adjust how they communicate with each other to cause changes in behavior via mechanisms that do not require immediate changes in gene activity. Although we knew the molecules of the brain must be continually manufactured to enable neuronal circuits to rewire as a result of age and accumulated experience, neuroscientists didn’t anticipate that the relationship between brain gene activity and behavior would be so tightly coupled. What controls bees’ responses when under threat? Why is there such a close coupling of brain gene activity and behavior? One hint comes from another bee study. Honeybees respond aggressively and immediately to a threat to their hive; in nature any prolonged delay could prove fatal. This behavioral response is much faster than the time it takes to produce new molecules of RNA, suggesting the initial response is more dependent on the neural system than the genomic one. Nevertheless, my laboratory found changes in the activity of hundreds of genes in the brains of individual bees in response to an intruder in the hive, hours after the threat was neutralized. The threatening experience changed them, in both molecular and behavioral terms. 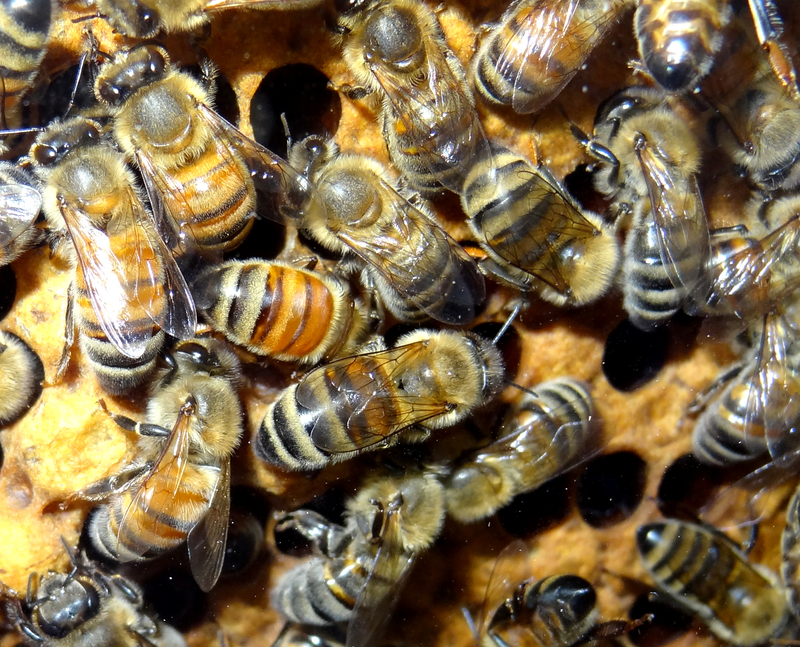 Coincident with the persistent changes in brain gene activity, which we could see via changes in amounts of each individual type of RNA molecule, was a persistent increase in the vigilance of the once-agitated bees. This makes good sense; while past performance does not necessarily predict future results on Wall Street, it is a safe bet in nature to remain vigilant after experiencing a threat. Experimental manipulations that simulated the gene activity profile of the post-intruder brain made naïve bees more aggressive, demonstrating a causal relationship between brain gene activity and behavior. The bee brain, confronted with a threat that might be recurring, has genomic apps that help it respond more effectively. My colleagues and I also showed that the same kinds of changes occur after stickleback fish and mice are threatened, suggesting that this slow, persistent, genomic response to experience is a universal property of brains. Neurons got the early glory, but don’t forget the genes. The brain’s neurons and the genomes within them, the hardware and the software, together orchestrate one’s response to a new situation, which can vary from person to person. The same dramatic event – a challenge at school or work, a new person in one’s social circle – might cause a great deal of stress in one person, and very little in another. We now think that the neural systems of two such people are likely tuned differently by their genomic systems, perhaps as a consequence of differentially stressful past experiences. In the living brain, unlike a computer, the software can help modify the hardware, and as new situations are encountered, the functioning of the neural hardware continues to modify the genomic software. Nature has come up with a “smart” system in which hardware and software are adaptable and interact dynamically! This reciprocity between genes and neurons continually builds on an interwoven history that stretches all the way back to inherited individual differences in temperament, which also influence gene activity. And while an acute stress might cause genomic changes that provoke fear and anger for a few hours, chronic stress due to deprivation or violence can cause debilitating health effects because it activates genomic changes in the brain that do not dissipate. In some cases, it induces long-lasting changes to the chemical structure of DNA; these changes, referred to as epigenetic, might even be passed down from one generation to the next. We need to learn how to better read the genomic record of changes left by experience in order to predict future outcomes. Not only would this deepen our fundamental understanding of the brain, but it would also help us understand how socioeconomic stresses “get under the skin” to negatively affect health and well-being. 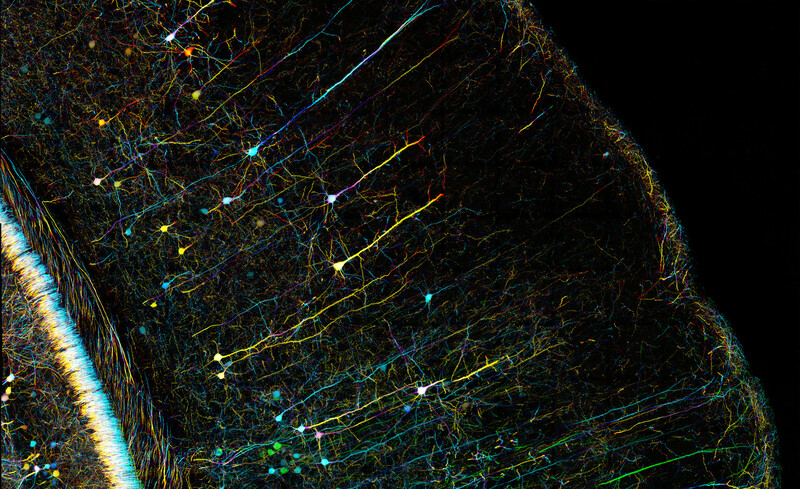 Research efforts, including the exciting new federal Brain Initiative, must focus on developing new technologies – both to measure neuronal activity with greater precision and to explore how the neuronal and genomic systems communicate with each other. Brains do more than direct our behavior. They build our experiences into a coherent perception of the world. This world will be as unique for each of us as our personal history, with the potential to be sunny, or cloudy, or filled with shadows. If we can become proficient in the code our brains run on, perhaps we can learn to give these narratives a nudge in the right direction, and flood every person’s world with light.